Participation in the CometVisu project is easily possible and also very welcome! Not only developers who would like to contribute new features or bugfixes are addressed, but also users who want to incorporate their own experience in improving the documentation. As CometVisu is developed by a bunch of people without any native english spoken person. Therefore Help an reviewing the english documentation is highly appreciated. Basically, there is no difference in the procedure, between changes to the source code and changes to the documentation, so the preparations are described here in a general way. The steps described below must be done once. that’s it, the local working copy is in the CometVisu subfolder. With this all preparations have been made. Now you have to wait until one of the maintainers of the CometVisu project reviewed the pull request. In addition, some automated checks are performed on the pull request to detect potential problems. If everything is alright, the pull request is gemerged by one of the the maintainers and so the changes are becoming part of the CometVisu project. If the maintainer has suggestions for improvement, he will do so through comments in the pull request. If this is the case, the advantage of the extra branch created in step 1 will now come into play. You just have to execute steps 2, 3 and 5 to execute the correction requests of the maintainer. Thus, the changes are automatically part of the existing pull request. If you e.g. Starting with new changes in a new branch, you can switch between the branches as you like and even edit multiple pull requests and changes at the same time without mixing them in terms of content. You can always switch to another branch after a commit (see step 3) git checkout name-of-the-branche. In order to keep the already merged changes made by other developers synchronous with their own fork, a pull request must be made from the private repository. 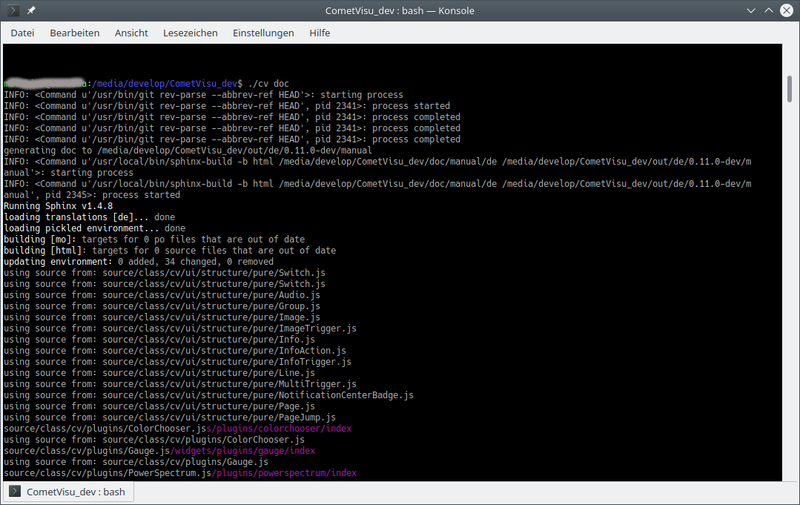 This branch is ... commits ahead of CometVisu: develop. Shows how many changes have been made since the last sync. Next to it is the link to the Pull Request, which in the following page shows the changes that can be merged into the private repository. Important in this comparison is that your own base fork is on the left and the official head fork is on the right. Accepting all changes synchronizes the changes from the main repository to the private repository. The local copy of the private repository must then be updated as well. To do this, you have to switch to the branch develop in the local repository (git checkout develop), where all the changes made by the developers are merged. The git pull command synchronizes the local and private repository. Now that all repositories are in sync again, you can continue with new changes to the documentation as described under 1. above. Of course you can also keep the local clone of his repository in sync via command line commands. To make this as easy as possible, you need to configure the remotes of your local clone accordingly. For the following examples it is assumed that the user name is gh-user and the CometVisu repository has been cloned via SSH (git clone git@github.com:gh-user/CometVisu.git). If cloned over HTTPS (https://github.com/CometVisu/CometVisu.git) the URLs will look different. This fulfills the requirements and you can create a local develop branch (this contains the latest developments) simply by a git pull update. A general introduction that provides both the most important basics of syntax and special ones. However, this section is intended to provide specifics used in the CometVisu documentation. With the knowledge of this section, it should be possible to write your own contributions to the documentation. The command ./cv doc translates the German documentation from the RST to HTML. For the English version, ./cv doc -l en must be called. Therefore you have to be in the root folder of the CometVisu. If every went well, it should start like this. If the project is set up correctly, but the documentation generation still fails due to not fulfilled dependencies, it must be checked whether the same Python versions (in particular Python 2 vs. Python 3) are used. 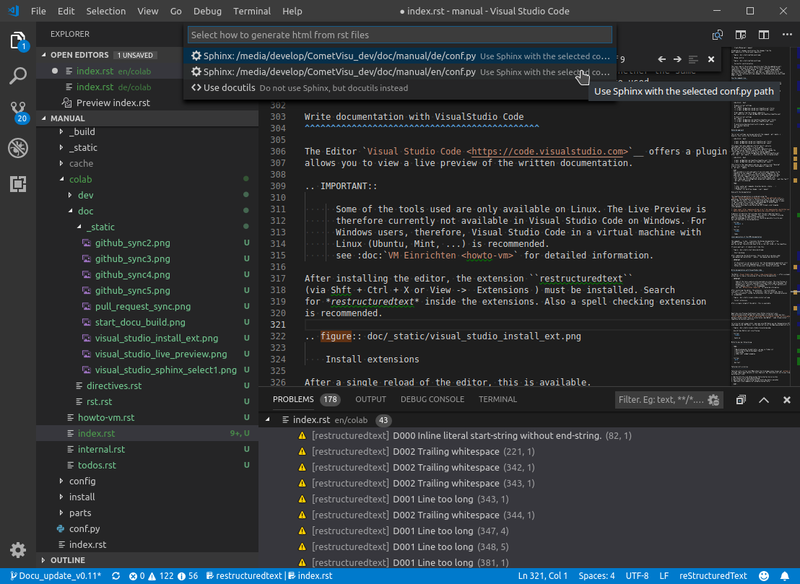 The Editor Visual Studio Code offers a plugin that allows you to view a live preview of the written documentation. Some of the tools used are only available on Linux. 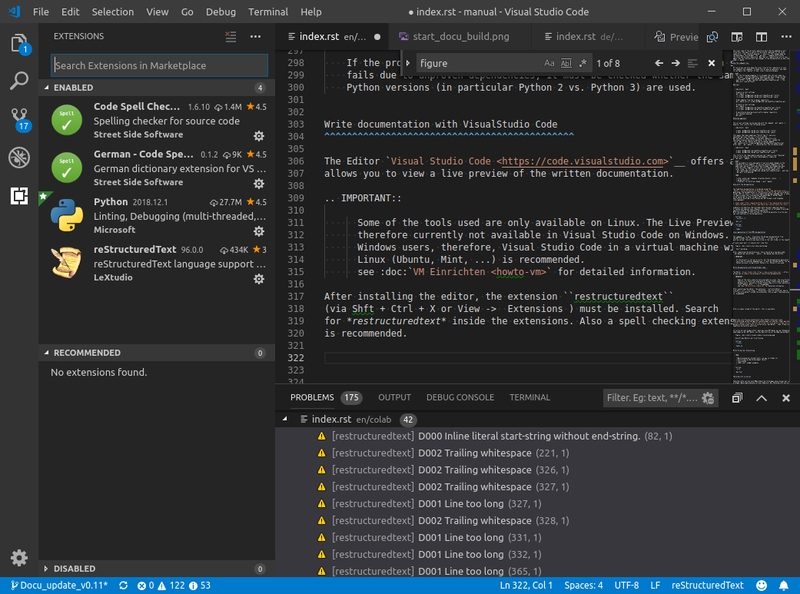 The Live Preview is therefore currently not available in Visual Studio Code on Windows. 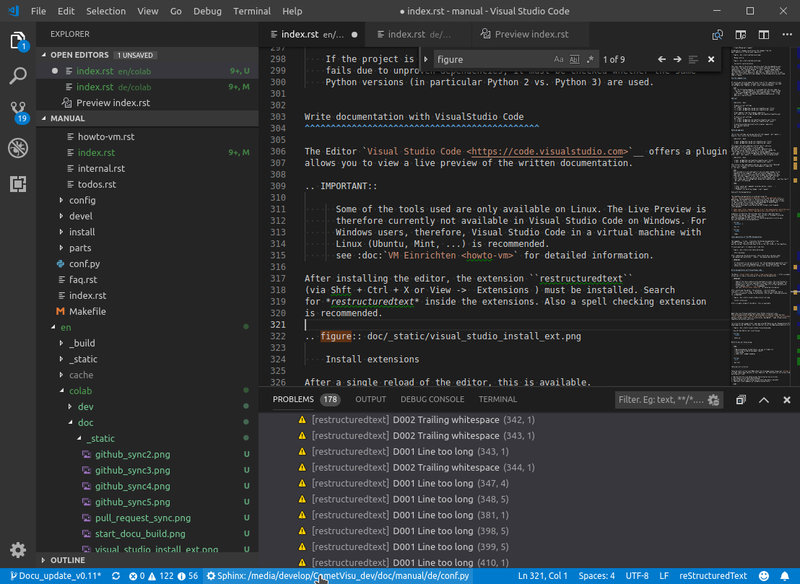 For Windows users, therefore, Visual Studio Code in a virtual machine with Linux (Ubuntu, Mint, ...) is recommended. see Set up VM for detailed information. After installing the editor, the extension restructuredtext (via Shft + Ctrl + X or View -> Extensions ) must be installed. Search for restructuredtext inside the extensions. Also a spell checking extension is recommended. 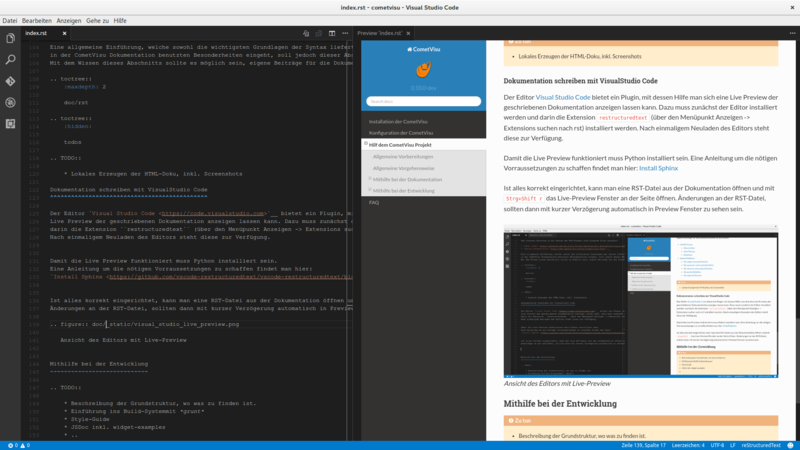 After a single reload of the editor, the extension is available. For the Live Preview to work, Python must be installed. A guide to create the necessary prerequisites can be found here: Install Sphinx. To install the required tools, use the sudo -H pip install -r utils/requirements.txt command Run CometVisu directory. If Sphinx is setup correctly, you can see the configurations available at the footer. By clicking on the footer you can choose between the de or en config to be used for the preview. So if you work on the english docu make sure en is selected, else you will not see your correct preview. If everything is set up correctly, you can open an RST file from the documentation and open the Live Preview window with `` Ctrl + Shift r``. Changes to the RST file should then be automatically displayed in preview windows with a short delay. Description of the basic structure, where to find something. What would the correct behavior look like from the author’s point of view? With uncertainties regarding the error can first in KNX-User-Forum or at Gitter ask for help. Beginning with version 0.11.0, there is an additional way to make troubleshooting easier for developers and to improve the bug reports. Users can record the behavior of the CometVisu and provide a so-called replay file (preferably attached to the issue as an attachment). The recording of the replay files can be activated with the URL parameter reporting = true (see: URL-Parameter). Once the error has been corrected, the log replay can be downloaded by entering the downloadLog() command in the browser console (open with F12 key). In addition to the automatic download of the file, its content is also shown in the console. So you can control which data is contained in the file. The replay files contain the configuration file, all communication with the backend and the user interactions (for example, clicks on widgets, etc.). Therefore, the user must agree to publish this data. It may therefore be advisable to create bugs with a modified configuration file, e.g. not containing sensitive data. The big advantage of these replay files, however, is that the developers can see a mock up of the original setup when playing these files. This allows the developer to see the error directly, fix it and test is the bug-fix works. Of course, there are also limitations, because not everything can be recorded by the replay files. If a user e.g. has adapted the existing designs and/or uses own icons/images, that are not part of the CometVisu, those files will not be part of the replay file and are missing when the file gets replayed.